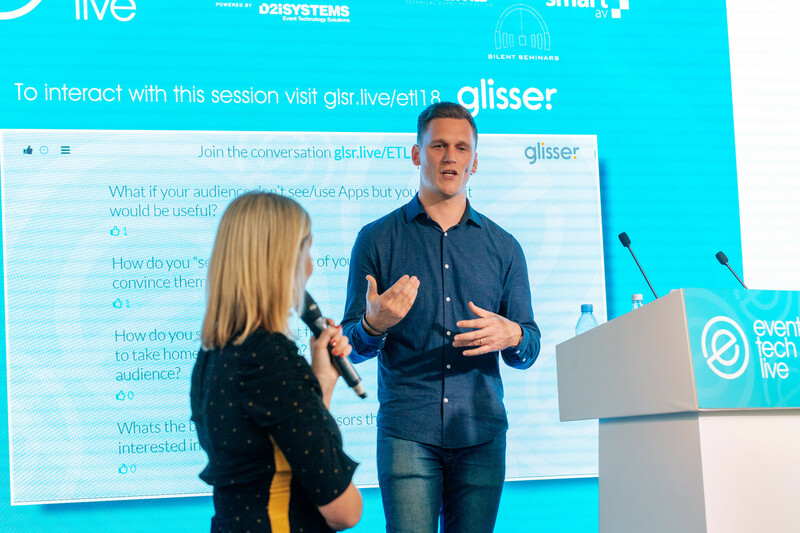 Author’s Note: This post is based on a seminar that Jack Tattersall, Senior Account Manager at Guidebook, hosted at Event Tech Live (November 2018 in London). To view the speech in full, click here. To hear more app expertise from Jack and our account managers, keep an eye out for our 2019 Guidebook Events and Masterclass schedule/calendar — there will be many opportunities to learn from the team on a variety of topics. Sponsorship is an integral part of any event strategy and delivering return on investment (ROI) for your sponsors is critical for an event’s success. In 2017 alone, it was estimated that 62.7 billion dollars was spent worldwide on sponsorship opportunities. It’s a staggering number and serves as a reminder of how important it is to offer brand visibility in a marketable and measurable way. Traditional methods of sponsorship once centred on print and display opportunities that were hard to track, such as a page in the event’s brochure or a logo on a lanyard. Sponsors were asked to part with their cash without any promise of how such brand visibility contributed to the business. Now event technology has opened up new opportunities for sponsors to reach an audience and can offer real insight into their behaviour. Your event app isn’t just for your attendees, it’s a channel for your sponsors to get the results they’re looking for. Creating a sponsorship strategy around your event will allow you to monetise engagement within your app and enable metrics driven discussions with your sponsors. With a mobile app for your event, you can offer a range of sponsorship opportunities and audience insights. Sponsored banners that are permanently seen on the homepage ensure your sponsors are getting the visibility they want for their brand. These are a more traditional form of sponsorship but these display banners within the app easily capture engagement metrics and allow sponsors the flexibility of linking to a wide range of content. Sponsored posts in the interact feed can be an effective way of communicating information to your attendees about your sponsors and generating conversation around their presence at an event. A sponsored push notification can reach every single user in the app at an allocated time of your sponsor’s choosing. Do you have multiple sponsors or want to offer a more detailed account of your sponsor’s presence at the event? A sponsors hub may be a good fit for sharing details on each of your sponsors. A user perusing this list can see thumbnail logos, then dig deep to find links and information. For a particularly high-level sponsor, you might feel it appropriate to give them their own menu item with a sponsored icon. The content is up to them – but it certainly affords the sponsor with great visibility and the ability to easily measure engagement. Custom menu items stand out, get a lot of taps, and allow sponsors to get creative with what type of content they link to. An app at your event doesn’t just generate trackable brand visibility, your sponsors can also gain valuable insights into user behaviour surrounding their sponsorship. Sponsored polls or quizzes are an opportunity for your sponsors to take advantage of the app’s ability to generate data. An awareness of your sponsor’s event goals will help you align a poll with the particular insight they’re looking to achieve. Sponsored sessions are another platform to give your sponsor exposure to your attendees. Create a session with the sponsor’s branding – perhaps featuring their name in the title. This can be used to measure the popularity of their session and the number of people registered as attending. Top menu items launched – see which menu items are launched the most frequently. Any item pinned to the menu such as a list item or schedule track may display here. Most viewed schedule sessions – see the most frequently viewed sessions in your schedule. Top viewed custom list – this section will show you which list items were most frequently viewed, across all of the custom lists present in your guide. Top items added to To-Do List. Sponsor impressions – track the number of times banner ads were displayed to users. Sponsor taps – the number of times banner ads were tapped by users. These metrics build up a picture of how users are interacting with the app, your event, and your sponsorship opportunities. Unlike traditional sponsorship methods, views and clicks are trackable. Drilling down into the data can also help shape your sponsor strategy for the following year, you can begin to understand what aspects of your event app prove popular with your users and begin to monetise these aspects of engagement. Begin your sponsorship strategy by setting clear sponsorship goals and outline the exact opportunities you’ll be offering within an app. It’s important to consider this from the perspective of your sponsors – how are you going to create value in your relationship with them? Understanding what they’re looking to achieve will help you sell these opportunities and create new revenue streams. There needs to be a balance between what you are selling and how this will relate to your revenue goal. The next step will be creating a clear, precise and confident plan that outlines what you are selling, who you are selling it to, how you will measure this and how it will be delivered. Your goals are always going to be tailored to your event, industry and the needs of your sponsors. Take into consideration the type of event you are planning and the promotional strategy you will use to achieve them. Don’t be afraid to challenge the traditional models of thinking when it comes to sponsorship! Common objections often centre on a fear of trying something new — we like paper, it sells well, we want to do what we did last time. Handle these objections by framing the conversation on how attendee expectations have changed over the last ten years. 10,000 of events worldwide used Guidebook last year. Paper guides are a point solution for the 2 days of the event, whereas apps start the conversation early and engage users before, during, and after. You can’t calculate ROI with traditional sponsorship methods but you can discover tangible information about your attendees with app. Digital impressions can directly correlate with revenue for your sponsors.